So the big floe looks like it popped out like a cork over the last 3 days. I thought I remembered a formation equivalent list, but I can't find it. Just that it is normally in "January/February". I will try to come up with such a database. It's more complicated as visual WorldView is not available during the dark months. It's more complicated as visual WorldView is not available during the dark months. Espen thanks, I actually prefer Sentinel. But is there a link that can provide a direct animation of Sentinel, in the style of Worldview? I usually access Sentinel images via the DMI web site, and while quite useful for short term work it's very tedious when comparing tens or hundreds of images. I think the answer is "No," but my computer has a program - Snagit - that can be used for a few screens. I click from screen to screen about a second per frame. The resulting MP4 shows floes are still moving [below - I wish I could make the image smaller...]. I can save the separate images within the MP4 as PNGs with exact same boundaries. The far end from rocket science. At work I'm limited to software they give me, and at home I'm a cheapskate. When handling the Sentinel image data, in this case the initial image a .TIF is >GB, you need a good editor to handle images this size, I use Photoshop CC 2017 (too lazy to download the new version) but it is far from the cheapest available, but the GIF animators are usually for free and very easy to use. Looking a bit weak beyond the next arch. Holy Moly Batman! Is that Nares Straight running like a tap in mid-winter??? It usually does until end-Jan or early Feb, so nothing out of the ordinary. But it's me to blame, as I haven't got around to summarizing the dates from past winters. I'll try to give you a hand Oren. And also scrolling back through this thread, I make it the following dates for the start of southern arch formation. The start date being the first date on which there are no more break aways. Dec 6th does seem very early. But I've had a crosscheck on the arch profile and several months later it is still the same as it was on Dec 6th. What did we agree on before ? That for an arch to qualify, it must hold for three days minimum ? ie if it forms on 1st March it must still be holding perfectly on 4th March ? In my opinion an arch is an arch if it holds for the rest of the winter, give or take a few bits and pieces. So if it breaks and flow continues a week later, it's disqualified. Would this depiction of current be correct? edit: Thinking about it, denser water would take the deeper channel but some may get forced to the surface in the shallows. Thought I'd check what Mercator thinks. Here is their model of current at 34m, sep1-jan18. Will look a bit deeper later. I agree. It should hold at least 1 month. I think also that, for this summarizing exercise, we only count arches within the Nares Strait and not in the Lincoln Sea. Ideally I would like to record the dates of the Kane Basin arch forming, but if none formed then the date of a northern arch in the Lincoln Sea. Ideally I would find the mental fortitude to go through the exercise... but recently too much work has taken its toll. I've had more time to look over various satellite images and here is what I have found for start dates. They really are very variable. The standout year was 2012/2013. After the record low ice year. The Petermann ice island had lodged in the Nares Strait and as early as Nov 11th the southern arch was beginning to form. Not 100% sure, but from today's picture, it looks like the amount of debris in the strait has reduced. Would that mean the current has become stronger? And another question: The cracks along the coastline are they due to pressure from above? And if so is it due to wind or another current? The floes are still making their way down the strait, see https://go.nasa.gov/2UbWItX for better resolution. Cracks along the northern coastline are nearly always there due to the ice movement, normally on it's way to the Fram. i take it the movement is mostly driven by wind then? A bit off topic, but perhaps relevant to Lincoln/Nares at the moment. A basic map of Arctic ocean currents, though it is more complex at different depths when looking in more detail. edit: not sure I even agree with that since it appears to have the Beaufort gyre going anticlockwise. Big Chunk heading into the Robeson and Kennedy Channels. Images are from 24th and 25th Jan. In years past, when a floe that size entered the Nares, we would discuss as to whether we thought it might hang up on Hans or Franklin Islands and contribute to the closing of the strait for the season. I am afraid that today's big flows from the Lincoln Sea are not at all like the thick rafts of MYI we use to see entering the Nares. These are fragmented MYI, knitted together with this years, very young ice. You can be certain it will shatter into tiny fragments as soon as it hits any obstacle. No one ever mentioned Santa. Bit the bullet and went back to november to look at surface current. Too cloudy before that. Great animation. It does seem as if the current comes from the north or northeast, rather than from the east along the Greenland coast. Also as I recall from summer watching, large floes directly to the north of Greenland sometimes go left, sometimes go right, and often linger in place, so I doubt there's much of a surface current there. Half of "Big Chunk" that headed into the Robeson Channel on 24th Jan has got stuck. Will it hold for long ? It may be assisted by the much bigger one now entering the Robeson Channel. Or get knocked out by it? Maybe. The pressure will come on. The GIf reminds me of that childhood trick that's done with separating/moving half your index finger and thumb. I noticed a slowdown. Now the rebound. This is quite exciting actually! We can't assume the 'big chunk' is way bigger underwater than we see in the sat pics and is therefore stuck, or can we? Would that mean the current has changed directions? In all probability the wind has changed direction. The current is rather constant I think. according to earth.nullschool.net, you are right. The wind has blown in this direction the last couple of days, though only very slowly (~5-20 km/h). In my layman's understanding a current should put way more force onto that chunk then the wind possibly could at such low speeds. Or maybe the current is still there, only not at the surface atm due to the wind and/or turbulence in the strait. Rebound suggests the stuck floe has depth and has slowed shallow current into the Nares. Maybe some back pressure but probably wind causing the rebound. The image above was a lucky catch as worldview has since replaced it with a slightly clearer view and it does indeed just look like slowdown. Enhancement doesn't offer too much more information though brightness temperature suggests the floe is thicker in places. The weaker sides that might have fractured are being compressed, the eastern side looking weakest. Some surface current is visible down stream on both sides, more on the west, probably refreezing meltwater. A bit odd as I think the strait is shallower on the west. Probably a healthy current at depth as floes downstream are moving quite rapidly. 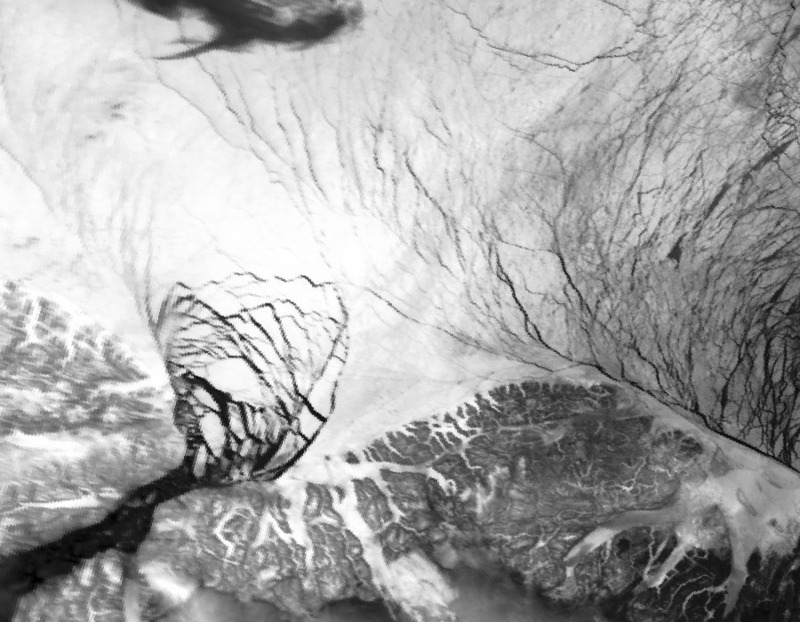 Suomi NPP viirs makes 2 passes over the arctic. This one is from the 'day' pass, a few hours later. Little chunk scrapes forward while its other half shatters and big chunk commits to the strait. It looks increasingly like we have a blockage. I think it's quite unusual to have a blockage inside the Robeson Channel. OTOH, the date is typical and wind reversal is a key ingredient. In any case, I'd delay judgement for a few days. But my bet is still on unblocking. There is some movement again today in the channel. Didn't hold for long. Popped like a cork and everything behind is on the move. Big block will be fun to watch.